What we might call Jesus’ vocational prayer shows that he understood his incarnational mission, his ‘coming into the world’, as the outworking, the enacting, of his eternally-decided calling. He comes into the world just to do the Father’s will—to offer his body, received as gift, back to the Father through the Spirit as the sacrifice. But what, exactly, is it that God desires for him to do? 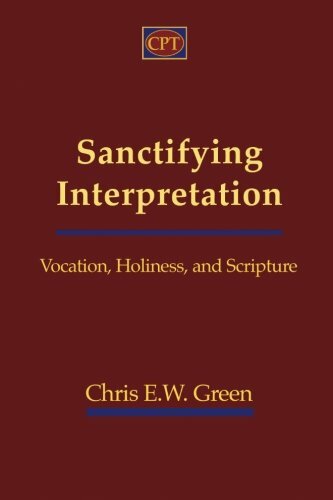 The writer of Hebrews, anticipating the question, provides the answer: ‘it is by God’s will that we have been sanctified through the offering of the body of Jesus Christ once for all’ (Heb. 10.10). Jesus’ vocation was nothing either more or less than this: to mediate God’s holiness to us, drawing us into the sanctifying communion he enjoys, reveals, and creates. And that is our vocation, too. Or, better, that continues to be Christ’s vocation, which we now share. Our vocation is his vocation, just as surely as his identity is gracefully ours. Through the Spirit, we are so at-one-ed with Christ that our experience and his are intertwined. What is true of him is true of us, now and/or in the End. As we ‘look to Jesus’ (Heb. 12.2), we recognize that we are created in him to bring the beauty of God’s holiness to bear on everyone and everything. As we cooperate with him in the Spirit, bringing holiness revealingly and redemptively to bear on all creation, we are providing our neighbors and enemies—as well as all other creatures in heaven and on earth, visible and invisible—with a foretaste of the shalom purposed from the Beginning, promised at the End. In so doing, we bear witness to the promise that in the glory of God’s Kingdom all things are brought into their peculiar glories, and in mediation we ourselves are brought into our own glory (1 Cor. 2.7). Of course, God often uses our neighbors, strangers, and enemies—including unbelievers and people of other faith traditions—to draw us into (re)new(ed) awareness of our calling. Think, for example, of Melchizedek, Rahab, Abigail—‘outsiders’ who in one way or another save ‘insiders’ from themselves. Even after proclaiming that the Spirit was promised to ‘all flesh’ at Pentecost (Acts 2.17), Peter still doubts that God in fact means to include the Gentiles in the kingdom. So, in a graceful twist, God gives him Cornelius (Acts 10), and we learn, as he did, that we need those whom we are called to serve with the gospel at least as much as they need us. Something on the same order happens in the story of Ruth. She, a Moabite, belongs to a neighboring people typically portrayed as dangerous for Israel, a threat to Israel’s holiness. But, as the story continues, we see that in spite of the fact that Israel has been unfaithful to to her vocation, God is saving her future through the faith(fulness) of this gentile. And, astoundingly, when Boaz praises her, he speaks her as a new Abraham: ‘you left your father and mother and your native land and came to a people that you did not before’ (Ruth 2.11; cf. Gen. 12.1). In his masterful Andrei Rublev (1966), Andrei Tarkovsky portrays the now-famous painter undergoing an acute spiritual crisis. Rublev has been asked to paint an icon of the Trinity, but he resists, drowning in his own sense of unworthiness. He believes his crisis of faith, his struggle to reconcile the love of God with the evil and brutality which he has observed in the world and in his heart, disqualifies himself to paint icons, to open heaven through paint. And so Rublev fasts. He fasts from speaking. He fasts from community. And he fasts from his vocation. Rublev, wandering through the countryside, happens upon a boy, Boriska, whose father, a well-respected bell-maker, has recently died, leaving the boy with the task of casting the bell the Grand Prince has commissioned for the village church. Afraid of losing the job, Boriska claims to know his father’s mysterious secret for bell-casting. But he in fact never learned it. So, under the threat of death, he forges ahead into the seemingly impossible task, brashly insisting at every turn that he does know the secret, trusting himself to his instincts and hoping against hope that the casting somehow will work. Unbelievably, it does work, and as the bell rings, with the Prince and the priests and the villagers gathered around the bell in celebration, Boriska collapses in exhausted relief and disbelief at his own success. Rublev, having seen it all from a distance (like Peter at Christ’s trial and crucifixion), rushes to the boy when he collapses, gathers him up in his arms, and breaks his long-held vow of silence with a promise: ‘You will cast bells. I will paint icons’. In that moment, Rublev, the believing, doubting monk, is freed anew for his vocation only through the unknowing grace of a poor, rash child. Rublev’s breakthrough occurs when he discovers his neighbor—not God—in his vocation. Through Boriska—observing and comforting him and promising to care for him as a father—by being Christ to his neighbor, as Luther once said—Rublev receives his vocation anew. He receives it liberated of the burden to justify himself through paint before the face of God. Sitting in the mud with a broken, grieving orphan, Rublev is truly free. He is free to paint icons. Perhaps, in the end, we, like Rublev (and Abraham, David, Boaz/Israel, and Peter, among others), can truly bear our vocation only as we receive unanticipated, unwarranted grace from others, especially those others we understand as most in need of our care. Only our openness to the gifts they—knowingly or not—bear for us can instill in our bodies the wisdom needed to speak the gospel gracefully to them. See Robert Alter, The Art of Biblical Narrative (New York: Basic Books, 2011), p. 71. See also Alain Marchadour and David Neuhaus, The Land, the Bible, and History (Bronx, NY: Fordham University Press, 2007), p. 36. Daniel A. Siedell, ‘You Will Make Bells and I Will Paint Icons’, Cultivare (March 12, 2012); available online: http://www.patheos.com/blogs/cultivare/2013/03/you-will-make-bells-i-will-paint-icons/; accessed: September 26, 2014. Siedell, ‘You Will Make Bells and I Will Paint Icons’, n.p.